When I woke up this morning, my body was still aching and there were bruises on my legs. My Sis asked me why I didn't sleep longer. I told her I'm still excited about the challenge and wanted to blog about it. Yesterday, SY (my team partner) and I arrived early @1U. We walked around so that we can be sure that we were ready for the challenge. We registered at one of the booth, got our tshirts and a gel (by one of the sponsors) and we were asked to style our hair. No prizes for the best hairdo though. Right after we had changed into our t-shirts, we went back to the booth and sealed all our stuff (wallets, handphones, etc). 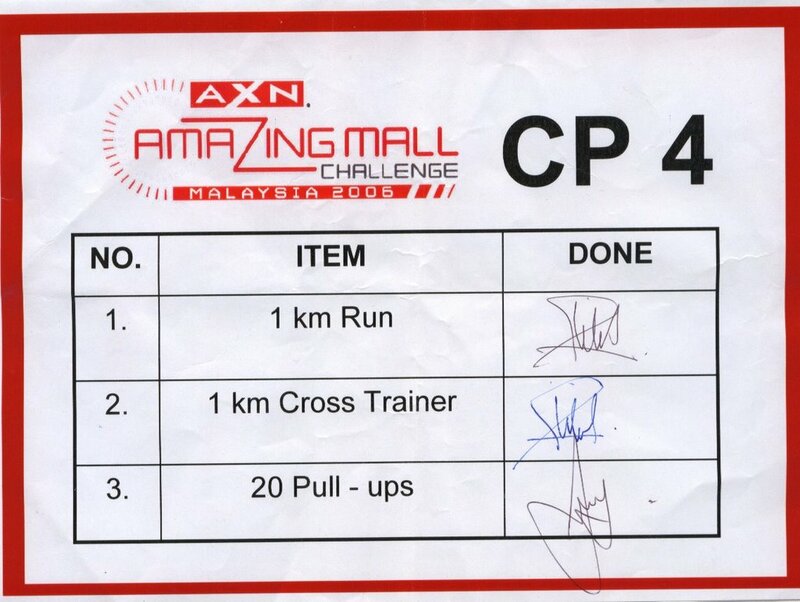 The Amazing Mall Challenge (AMC) started slightly later than the schedule which was supposed to be at 1 p.m. sharp. 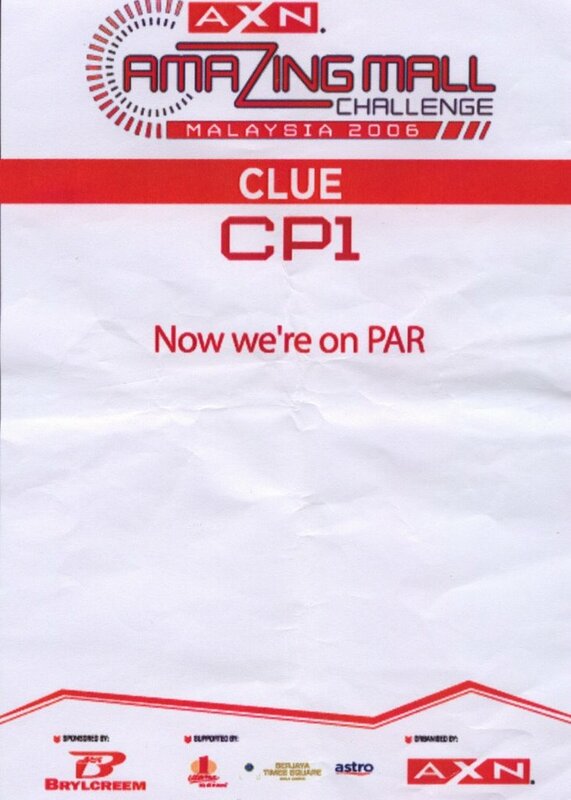 During the briefing, each team was given an envelop containing three checkpoint (CP) clues inside. We were told that we can do the first three CPs at random but at CP4 onwards until CP13, we need to perform the tasks in sequence.So we read our clues and off we went! CP1 - 3: My team (Team 21) decided to go for CP3 because we (and most teams) thought it was better for us to go to the upper floor first as that was where the the cinema was. It turned out that the cinema wasn't the right place. Then, we tried at MPH to see if there's this "Big Fish" DVD there but again we failed. 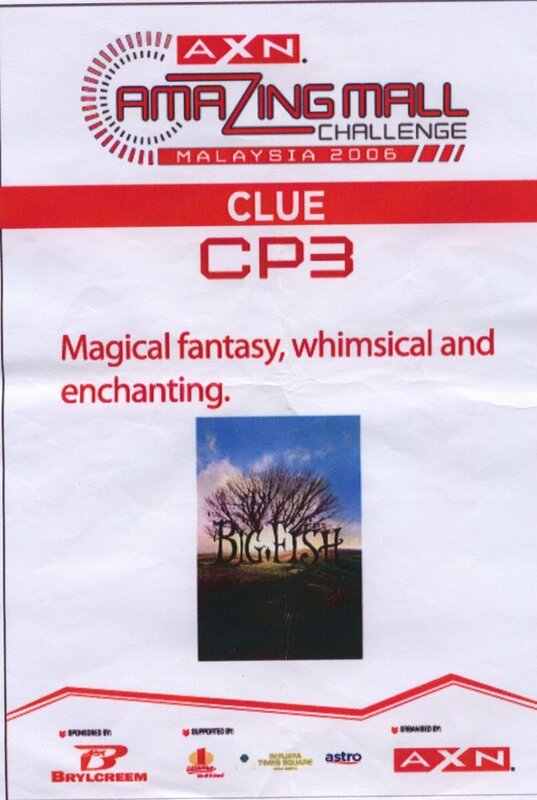 We tried the second clue at CP2 which we thought were at Starship Galactica. Again we were at the wrong place. Then we decided to go to the lower ground floor and we were lucky to see other teams at Movie Magic! So we knew we were at CP3. The marshall was standing way inside the store and we saw everyone looking at Nelly Furtado's poster. We went to the marshall and read our task. We were asked to find a highlighted letter. They did not specify any particular poster or dvd but since everyone was looking at the poster, we looked out for the "highlighted letter" on the poster. Straight away we saw the letter "A" which was highlighted with a red-coloured tape. 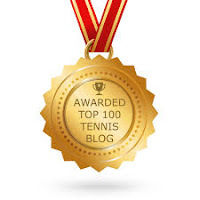 It was amazing because there were other teams who can't see it. Since it was a tight challenge at the beginning of this stage, we decided to only help Azlan's team (he was the husband of SY's colleague). Then we proceed to CP1, a golf shop which was a few shops away. We were required to perform golf putting and hit a ball into the hole each. It was an easy task. So now we needed to proceed to find CP2. Almost all teams were clueless and struggled to find CP2. We went to Celebrity Fitness because we thought it could be the right place as the clue said "..play among the stars". There were marshalls there but turned out that it was CP4. We walked to the escalator and we were lucky enough to see a team and a couple of marshalls at a shop that sells travelling bags. We quickly dashed to the shop and perform our task which was to find an AXN tag. At the back of the tag, there's a clue saying "Superstar". 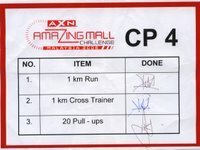 We knew our CP4 was at Celebrity Fitness. CP4: SY and I were the first team to arrive. First we had to run 1km each on the treadmill. That was completely exhausting as we rarely jog. Not to mention that we had never been to a fitness centre before. Another team (the guys from Explorace) arrived and in no time they beat us at this challenge. More teams came in. Then SY had to do 20 pull-ups and finally both of us had to perform 1km cross trainer each. No doubt this was the worst physical challenge of all. Once completed our challenge at CP4, we were given a baseball as our next clue. CP5: On the baseball, there was the word "Hitachi" and a web address "www.hit.com.my". There was an electrical shop nearby and we tried our luck there. Since there were no marshalls around, we knew we were at the wrong place. So we decided to go to Starbucks or the nearest computer shop to borrow a computer to check out the website. We went to a computer shop and the owner was kind enough to let us use one of their laptops. We were surprised to find out that there's a batting cage at the rooftop of 1 Utama! Newly opened in mid 2006, it is the first automated batting cage in Malaysia. We headed to the rooftop and we saw a few teams there. We were required to hit 6 balls. After a few tries, we managed to complete the task and head on for the next CP. CP6: We sucked at this CP. We spent so much time looking for the wrong places. At first we thought we are going to Nando's to have a feast (coz we were too hungry!). Finally we were lucky enough to met up with one of the member from Team 6 (sorry I couldn't recalled your name) and her team member Renee already left for Berjaya Times Square. She told us that CP6 was at the bowling centre (for god sake, we had no clue that "turkey" is a term used in bowling which means three strikes bowled consecutively). She on the other hand, had been looking for CP8 and we told her it could be rock climbing. Then, we rushed to the bowling centre. Thank god we didn't have to strike a turkey but only need to complete two frames (a combination of 10 pins for a team). We quickily finished the task and headed to CP7. 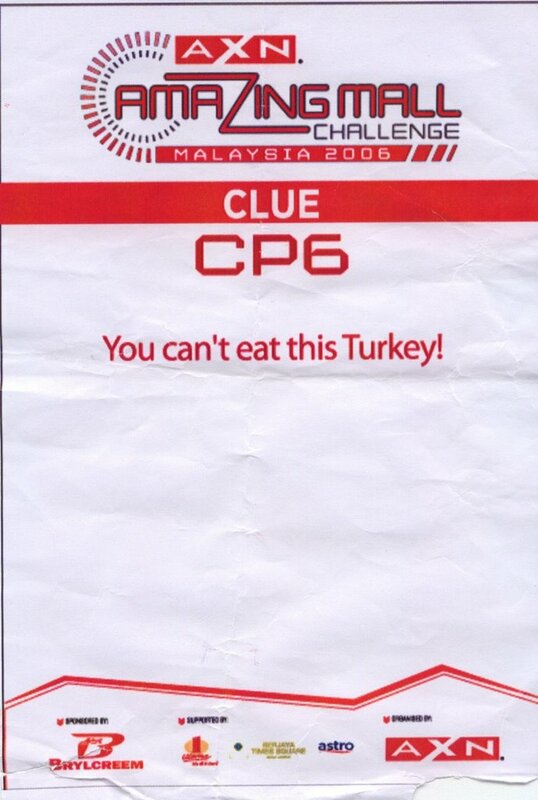 CP7: The clue for CP7 was easy to understand. It said something like "Tarzan's hometown" and we knew it was at the Rainforest. We were asked to get 2 members of the public to drink 2 bottles of mineral water. We went to the nearby restaurant and get two brothers (many thanks to Nicholas and his little brother) to perform the task. Once completed, the marshall told us that our team had to be separated; one of us will perform an extreme challenge and two other tasks while another team member had to go to Berjaya Times Square. So we decided that SY stayed in 1U and I went to Times Square. CP7b - c: Many of us had to wait for the bikers to bring us to Times Square. After waited for like 15-20 minutes, it was finally my turn. It was a terror ride! Never in my whole life I was on a bike riding at 120km/hour on a highway to the congested KL city! I kept praying that all of us going to Times Square would be safe. Once arrived at Times Square, I quickily formed an alliance with Team 1 and we headed for our first task there. We knew we had to go to the theme park. Our task was to ride the DNA Mixer (it rotates in different directions 360 degrees) while solving a mathematical sum. My strategy was to get on the ride and quickily did the calculation in my head before the ride started. It was a helluva ride! The girls were screaming away while Azlan who was sitting next to me, and on his second ride, felt really uncomfortable. 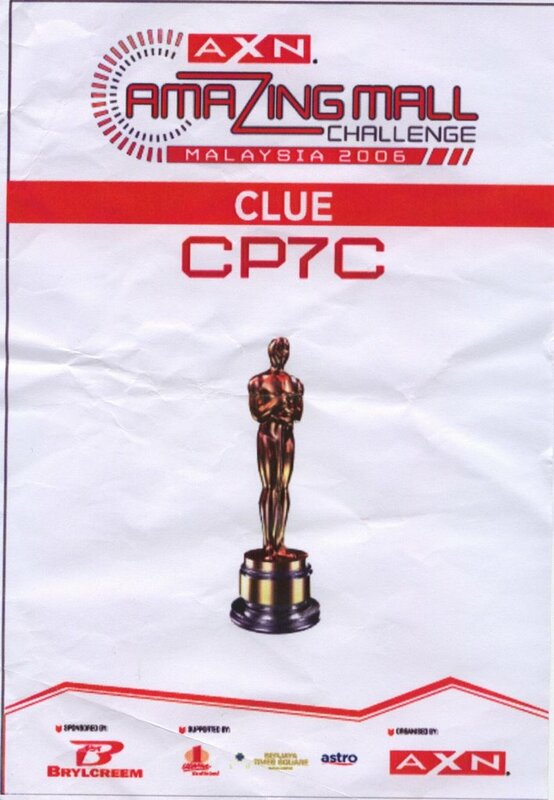 We managed to give the correct answer and head on the next CP, which was the IMAX theatre. 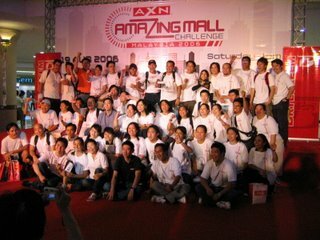 We were given a torchlight and inside the cinema, we had to look for an AXN sticker each. Luckily the cinema wasn't really big and all of us managed to find the stickers in a couple of minutes or lesser. Now, we had to go back to our drop off point. On the way down, I saw Azlan sitting on the floor near the escalator. He said he had a cramp. Since there's no marshall, I stayed on and helped him push his legs. After a couple of tries, he seemed a lot better and we continued running back to the drop off point. There, all of us had to wait for the bikers to pick us up. I had to wait for about 15 minutes again. It was wasting time and there was nothing we can do to go back to 1U. We had no $ and the traffic was bad. So, we chitchat while waiting. Coincidently and thank god, I had the same biker who brought me to Times Square earlier on. CP8: Earlier on, @1U, while I was waiting for my turn to go to Times Square, SY had to go to CP8 and perform the rock climbing task. She had an experience at the Outward Bound School (OBS) but it wasn't a good one. She always told me that it wasn't an easy task but insisted that she would do this task if it's one of the challenge. She also told me that at OBS, she only managed to climbed half way before giving up. 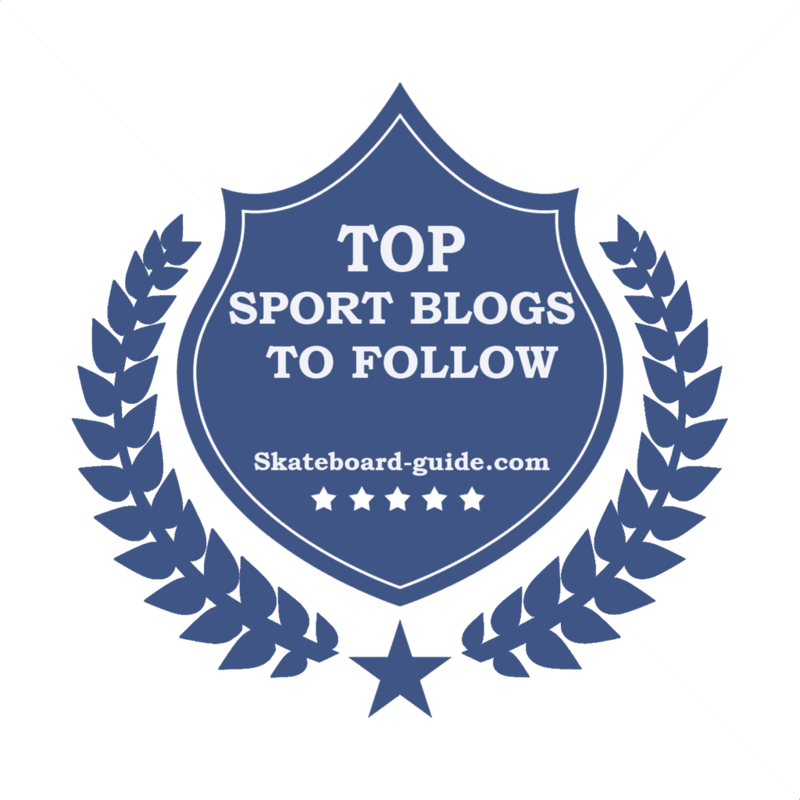 However, her perception towards rock climbing completely changed right after the challenge at CP8 because it wasn't as tough as it seemed to be. She completed the challenge and head on to the next CP. Well, SY, I am proud of you because you managed to overcome this obstacle because this is the challenge that made us worried even before we decided to join this AMC. CP9: While I was still waiting for my biker at the taxi stand, I saw SY heading to the central park opposite 1U. It turned out it wasn't the right CP. She knew that CP9 was either at the central park or at Giant. It was indeed at Giant supermarket. There she had to buy a list of 15 items. Some of the shoppers were very helpful. The problem with this CP was there were a few items which were out of stock and some of the teams had to wait for it to be replenished. Once the task was completed, SY had to go to CP10 to perform more task. CP10: At first, SY thought that CP10 couldn't be the rainforest because she had already been there in our previous task. However, she followed her instinct and went there anyway. At the rainforest, she had to perform a task whereby she had to transport 5 eggs from the fourth floor onto the ground using a string. She had to wait for some time because only two teams were allowed to perform the task at a time. They had to transport the eggs one by one, touching the ground without breaking it. SY broke one egg and she had to eat an egg which turned out to be a half boiled egg (supposed to be hard-boiled). 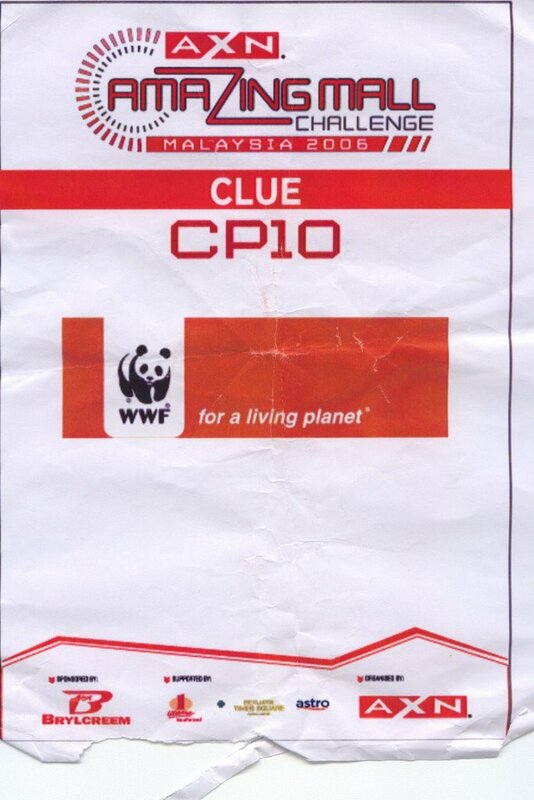 CP 11: I was back @1U and saw a few teams solving jigsaw puzzles. SY was nowhere to be seen. So I had to wait for her. I chatted with other teams and found out that there were only 7 bikers during the entire race. We found out that there was one particular team who had to wait for 1 hour for her biker to bring her to Times Square. We also knew that the team who won was from the Explorace Challenge (shown on TV3). SY finally arrived and in a couple of minutes we completed the task and moved on the the next CP. 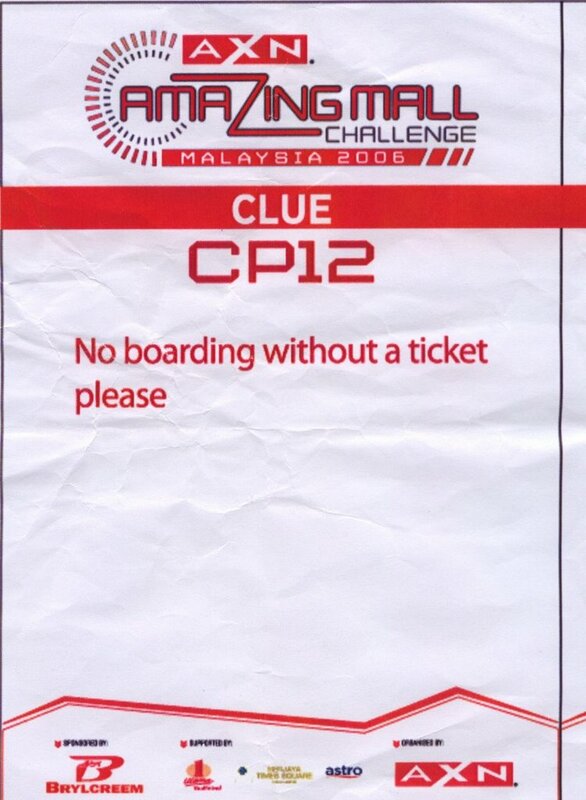 CP12: We only had about two minutes to solve this clue. 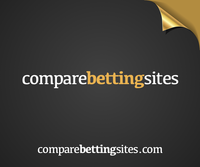 We tried a few places including Travelmart. However, the bell was rang and time was up. We finally knew that CP12 was at Kluang Station. We were just one CP away from the finishing line but we had tried our best. We went back to the finishing line. My Sis and our friend, CC, were there waiting for us. We didn't really know what was our position or how well we performed. I think only the first three places matters. After all, this was just a fun race. After the prize presentation, we had a buffet dinner. We said goodbye to some of the teams before knocked off at about 8 p.m. We brought home a goodies bag and a certificate of participation each. SY and I really had a splendid time meeting new people and doing things that we never or seldom do before. It was our first experience participating in such race and we are looking forward to more competition like this in the future.